The right ping pong paddle can take your level of play from ordinary to extraordinary. The way it fits in your hand, the design of the handle and even the type of rubber used on the surface can all change how you hit the ball and where the ball goes. While we reviewed a number of great models from top manufacturers, we found that the JP Winlook Ping Pong Paddle is the best one on the market. This racket comes in both a flared handle option and a straight handle option. Its International Table Tennis Federation approved rubber will make every ball you hit go exactly where you want. Find out what to look for in your next paddle before looking at some of the top models we found. Choosing a ping pong paddle isn’t as complicated as you might think. If you have questions about what to look for, just read over our handy list. The first thing to look for is the material used in both the blade and the paddle. While the paddles that come with most tables use plastic, plastic tends to break and splinter within months. You want a paddle that uses wood or a combination of wood with another material like titanium or even carbon fibers, which will last much longer. A ping pong paddle typically consists of both a handle and a blade, and the blade is the part of the paddle that actually hits the ball. The best paddles have at least five layers of materials in the blade. If you can afford to spend a little more, you’ll find paddles with five or more layers in the blade. Pay attention to the texture of the rubber on the outside of the paddle. A deeper or larger texture will give you more speed but less spin, while a thinner or smaller texture will give you more spin but less speed or power. Some paddles have a different type of rubber on each side to give you the best of both worlds. Underneath the rubber on the blade is a layer of sponge. Paddles with a thicker layer of sponge can accommodate more speed and will let you use more strength, but these paddles are heavier and are sometimes harder to use. Paddles with a thinner layer of sponge are more lightweight and manageable but require that you use less speed. If you want to play in competitions and tournaments, make sure that the paddle you choose has approval from the International Table Tennis Federation. You can only paddles approved by the IITF in most games. If you’re looking for an all in one solution to provide you and your friends some serious play time, look at the JP WinLook Ping Pong Paddle 4 Pack. This set comes with four high quality wood paddles, eight tournament grade balls, and a carrying case for all equipment. The paddles are made with a 5 ply wood blade and slightly flared handle, and the blade is topped with a cushiony yellow sponge layer covered in high performance red or black rubber. The JP Winlook paddles are a great choice for a player of all levels (beginner, intermediate, or advanced) looking for a friendly game with friends and family, or for beginners looking to get some serious practice in while attempting to up their game. Buy this set with confidence knowing it comes with a 60-day money-back-guarantee plus one year free replacement warranty. The JP Winlook paddle set is easy to use, easy to store, and easy to transport, making it a great gift option for the family or for friends looking to get more involved in ping pong. Also from Killerspin is this RTG Diamond CQ Premium model, which just narrowly missed out on our number one spot. This might just be the best ping pong paddle for spin because it lets you put just the right amount of spin on any return shot or serve that you make. We recommend the flared handled model, which weighs less than 180 grams and delivers all the control that you need. Control is important while on offense or defense. This paddle helps you better line up your shot and ensure that the ball goes exactly where you want it to go. That flared handle also has somewhat of an ergonomic design that measures just under four-inches long and will fit perfectly in your hand during even the longest of battles. Despite the impressive amount of control that it offers, this racket is more lightweight than you might expect and features an overall thickness of less than one inch. Designed for use in fast-paced games, this racket will help you increase your speed and send back serves in the blink of an eye. The rubber cover and other features all have approval from the International Table Tennis Federation. Speed, control and power all come together in one handy package in this Balsa Carbo X5-FL 80 Proline Racket from Butterfly. Made from balsa wood, the handle is so soft that you can hold it for hours without missing a beat, but you’ll also love the carbon fibers added to the design, which gives you an impressive amount of both power and speed. Those carbon fibers will also help you add more topspin or backspin to any shot. Butterfly designed this paddle specifically for those who prefer a heavier spin, but it also gives you more control over your overall speed. It even has a bigger sweet spot in the center. Though it may take some experimenting before you find that sweet spot, once you do, you’ll return balls with amazing accuracy. This racket has a 100 speed rating, 80 spin rating and 95 control rating. It’s the perfect table tennis racket for those just starting out as well as those who want to upgrade to a better model, but it also comes with features that will make any professional player stand up and take notice. Playing with this paddle lets others know that you are serious about your game and performance. For a more affordable table tennis racket that can still improve your performance, consider the STIGA Pro Carbon Table Tennis Racket. Though it’s the cheapest model that we included on our list, it still has nice features that make it great for those just starting out in competitions. It comes with a sleek rubber coating that has approval from the International Table Tennis Federation for tournament play. STIGA developed its own carbon blend, which gives this paddle more power and lets you put more spin on your shots. It has a 100 spin rating, a 99 speed rating and an 80 control rating, which are actually higher than the ratings found on some more expensive rackets. The racket also comes with seven layers of materials that make this one feel more lightweight in your hands. The S5 rubber used on the surface won’t wear down like other cheaper types of rubber will, and it has two mm of sponge underneath that rubber too. That sponge absorbs some of the speed produced by the ball and will help you return even the roughest of serves. With its angled handle, this table tennis racket is one you can play with for hours without experiencing any discomfort. Killerspin has met great success in offering a low priced version of their high performance paddles while sacrificing little in quality. The Killerspin JET200 is all about the basics of defense from its simple design to its straightforward construction. Since defensive players need less spin and speed, but more control, the JET200 has this kind of player covered. Out of 10, the Killerspin JET200 is rated at 8.5 for control, 7 for spin, and 6 for speed. This racket is also a great choice for someone just starting to get more competitive, but who needs more practice with control before moving into the more subtle art of spin and other offensive techniques. The Killerspin JET200 also features a flare for fun in its color variety. This paddle can be purchased in either navy blue, lime, or mocha. No matter which color is chosen, they all come with a 30 day warranty, and solid 5-ply construction for ultimate durability that will last as long as needed until a beginner is ready to move to a more finicky, higher performing paddle. The STIGA Titan is an ideal choice for the beginner looking to up their game. It’s affordably priced and provides just enough power and control so as not to overwhelm the player while they’re working on key techniques for improvement. It’s rated at 80 for speed, 77 for spin, and 82 for control, making it an ideal defensive player paddle. It’s also ITTF approved, so it can be taken into a tournament match. It’s perfect for those beginning to play at tournament level, but who are not quite ready to move into a paddle that’s harder to control. Constructed solidly, it’is built with a 5-ply extra light blade and a 2mm sponge surface that’s features crystal technology for increased hardness and speed. With maximum comfort in mind STIGA features a concave Italian composite handle for the Titan with a light balsa wood center that spans from the entirety of the handle center. Another affordable, well-made ping pong paddle is the STIGA Evolution Table Tennis Racket. It was made with well rounded execution in mind, which is reflected in its high rating in all three performance categories: Speed/96, Spin/94, and Control: 90. The STIGA Evolution is a great choice for someone looking to play a tight offensive game, while still enjoying a moderate amount of control over the ball. It will give you the spin and speed you need to stay in control of the game and keep your opponent on their heels. The construction of this STIGA paddle is as dependable as its performance. It features a 6 ply light blade made with premium rubber and a 2mm sponge under-layer. The surface of the blade is constructed with nano-composite technology, which enables the paddle to return the ball with more speed and spin thanks to tight bonds in the rubber. A particularly unique feature is the concave pro handle outfitted with a Shock Dispersion Tube (SDT) which absorbs vibrations from contact with the ball and channels them through the tube and out the end of the handle. This translates into a smoother hitting experience for the player. This DHS ping pong paddle proves that you don’t need to spend a lot of money to improve your game. As one of the more affordable models on our list, it comes with a great design and loads of features that will help you battle opponents. 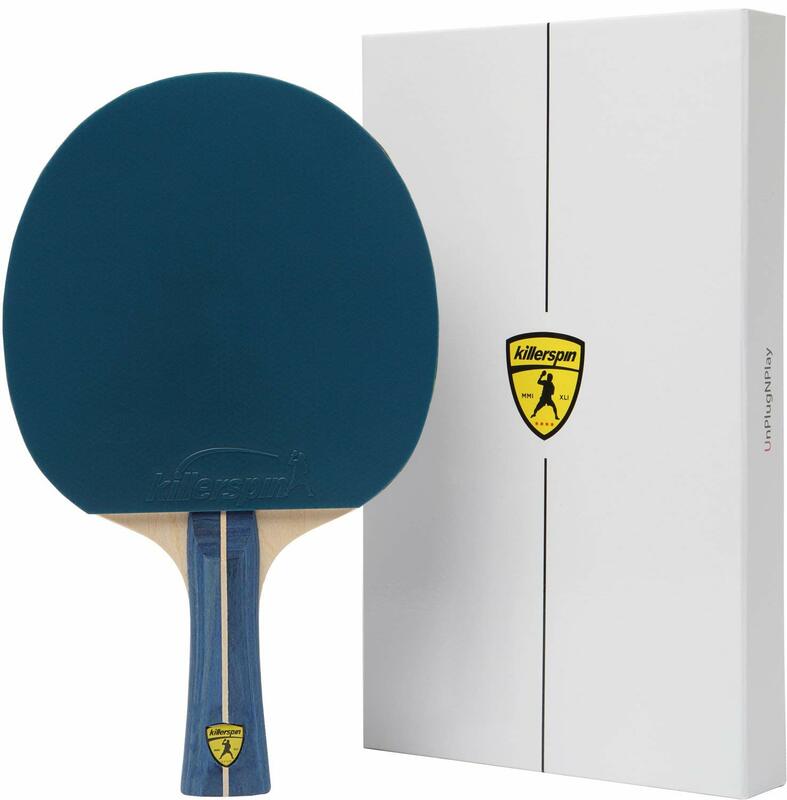 With the approval of the International Table Tennis Federation, this paddle is suitable for both fun games you play against friends and tournament play. Both sides of the ping pong paddle feature rubber coatings that grip the ball in just the right way to ensure that the hits you make use of all your strength. One side features a bright red rubber cover, but the other side comes with a black rubber cover. Both sides have a textured finish with dimples in the rubber to absorb the speed of the ball to reduce injury to your hands and to disperse your own strength to make the ball fly right through the air. This is one of the only ping pong paddles on our list that is also suitable as a gift. DHS puts the HURRICANE-II table tennis paddle inside a gift box and also includes two ping pong balls, making it a great gift for friends who love the game. Though similar to the JET600, the JET700 Table Tennis Paddle, which also comes from Killerspin, is better for advanced players and those with more experience. It feels a little heavier in your hand, but that heft gives you more accuracy and control. You can almost pick a spot on the table, hit the ball with this paddle and see it land right on that spot. The JET700 comes with features not found on previous models too like a wooden tape designed by Killerspin. Placed around the edges of the paddle, this tape does a good job of keeping moisture away from the wood layers inside the blade. The tape protects the wood from the elements and extends the life of the paddle. You’ll also appreciate the high-tension rubber used on both sides of the blade. That rubber covers the seven-ply wood that makes up the blade and gives you more control. Some players will find that the lightweight rubber pieces also help them improve their aim and add more strength to their serves as well as helping them handle both long and short return shots. Our leading choice for a table tennis racket is the RTG Diamond TC Premium from Killerspin. Killerspin is one of the top names in the table tennis industry and has a unique understanding of what players want and need. The company made this paddle in two different models to let you choose between whether you want one with a flat or an angled handle. The flat handled model is great for those who want to put more force on their serves, while the angled or flared design gives you more control. Both models feature a design that has approval for all levels of tournament and competition play. You’ll like that Killerspin used two layers of titanium carbon, which puts more spin on your balls and gives you a little more speed. Many players will also appreciate the wood blade, which uses five layers of wood to make this paddle more durable than its competitors. Another top feature is the rubber that coats the surface. This thin layer of rubber both absorbs the speed at which a ball comes at you to help you return it effortlessly and puts a small amount of spin on your returns. This amazing paddle also comes with a warranty from Killerspin that offers you some added protection. The Killerspin JET800 isn’t just one of our favorite paddles for its elegant, classic design: it’s also an extremely effective racket too. Rated out of 10, this paddle comes in at 8 for control, 9 for spin, and 9.5 for speed, which makes it a great choice for the offensive player seeking to dominate the game. It’s made of seven layers: 2 layers of carbon fiber and five layers of high quality, lightweight wood. 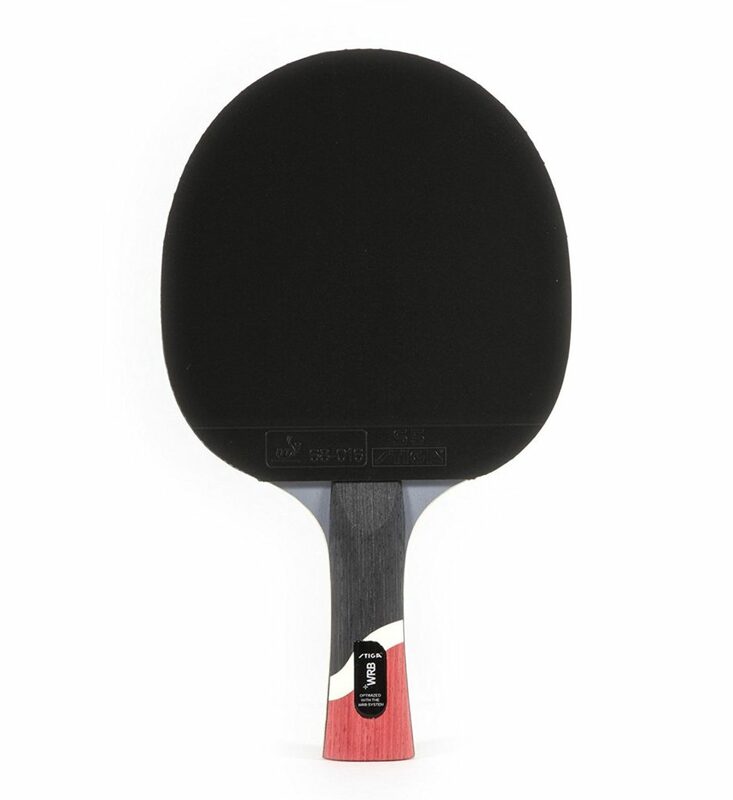 The blade is covered in ITTF approved Nitrx 2.0 mm rubber (red on one side, black on the other), and the entire paddle is bordered in a wooden side tape, which besides adding a sophisticated aesthetic to the overall design, also absorbs energy while playing. The Killerspin JET800 handle is flared — a popular choice for serious ping pong players because it’s less likely to slip from the player’s hand in the middle of a heated match. Find the right point on the handle that’s most comfortable, and enjoy piece of mind that this racket isn’t going to slip out of your hand anytime soon. And, if you’re the sentimental type, the Killerspin JET800 is packaged in a memory book box that you can use for score keeping, messages, or autographs. Killerspin appears several times on our list because amateur and professional players love their table tennis paddles, which includes the JET600 paddle. Unlike other paddles that are only suitable for one type of player, this paddle is perfect for all types. Even if you just bought your first table tennis table, you can use this paddle to kick off your game the right way. Intermediate and advanced ping pong players will love this paddle because of its sleek and dependable blade. That blade features five thin layers of wood that extend the life of the blade while also improving the accuracy and speed that you get out of the paddle. The textured rubber on top of the wood does a good job of ensuring the ball will glide right off the paddle instead of sticking to it. In addition to a 30-day warranty, Killerspin also rated this paddle based on the performance that you can get out of it. It has an 8/10 speed rating, 8.5/10 control rating and 9/10 spin rating. Those high ratings let you know that the JET600 will give you all the high speed that you need during competitions while also ensuring that you get the right amount of spin and have more control over where the ball goes. Become the king of queen of the ping pong table with this Andrzej Grubba FL Proline Racket from Butterfly. Great for those just starting out and for more experienced players, this model is one of the top sellers from the history of the company. It comes with a speed rating of 75 and a control rating of 100 on a 100 point scale. Designed for those who like using topspin or backspin on their balls, this Proline racket has a unique blade that is a little smoother than other models. This lets you twist your wrist the way you want and to strike the ball at the right angle to make it spin right across the table and away from your opponent. It does such a great job that this paddle even has a spin rating of 80. Made from several layers of dependable wood with a rubber coating, the blade on this paddle can help improve your accuracy too. That blade helps you turn the paddle to hit the ball with the sweet spot on the paddle to make that ball go exactly where you want it to go. Many players will also find that this paddle helps them put more speed behind their shots too. With this Butterfly DRIVER 4000, you’ll feel confident every time you step up to the table and see an opponent waiting for you. The International Table Tennis Federation granted approval to the manufacturer for the rubber it uses on the top coating. That rubber does a great job of both absorbing the shock and speed of the ball as it comes towards you while also putting more power behind your returns. Designed for offensive players, this paddle will help you stand up to your opponents and get you ready to attack. The unique design of the paddle includes a larger piece of cork that sticks up slightly from the handle. When you wrap your hand around that cork piece, you get a better grip, which helps you put more power behind your serves, but the cork also absorbs some of the pressure from your hands to reduce your discomfort. This is one of the best and most affordable ping pong paddle players looking to improve their return serves and those who want to put more spin on their returns. This paddle is a little more lightweight than other models designed for offensive players to reduce the fatigue that you experience during longer matches. Look and feel like a pro player with the Killerspin Kido 7P Premium Straight Table Tennis Paddle. With shades of black used on both the blade and handle as well as along the edges, this paddle has an almost angry look that will let your competitors know that you mean business. While it looks great, the paddle performs even better. The seven-ply blade on this model will give you an edge in any competition or game. Each of those layers is thin and lightweight and won’t add to the overall weight of the paddle. It also comes with high-tension rubber covers on both sides of the blade, and that combination of wood and rubber will improve your performance when you first start out and as you gain more experience. The only reason this one ranks so low down on our list is because of its larger handle side. That handle has a slightly flared design that features a thicker piece of wood in the center and thinner pieces along the edges. Depending on the size of your hand and how you grip the paddle, you may find that this handle is a little too larger or that it causes discomfort after extended playing. Players of all skill levels know the name JOOLA, but the best paddle that we found from this company is its Spinforce 900 Racket. This racket comes fully assembled and ready for your next match as soon as you take it out of the box. 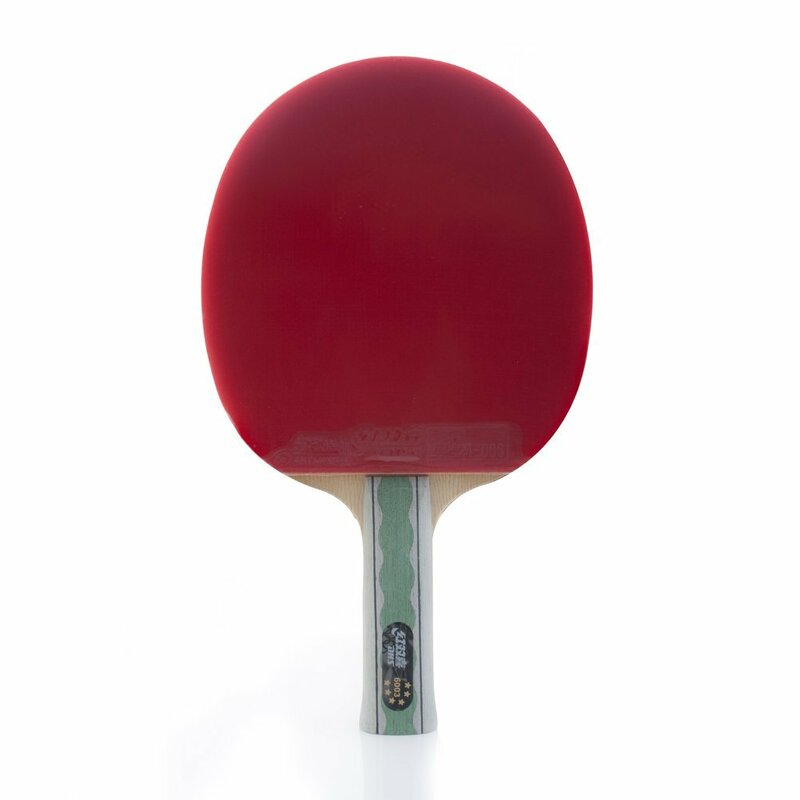 As it has approval from the International Table Tennis Federation for tournament play, the paddle is suitable for home practice matches and professional games. JOOLA designed the Spinforce with a unique system that includes plywood and carbon in its blade. A thin layer of sponge added to the surface of the wood helps absorb some of the shock and power of the shots that come at you, while the Infinity rubber over that sponge sends back balls with an impressive amount of force. The paddle features seven thin layers of wood inside the blade for maximum power. Before releasing this paddle, JOOLA asked players about their preferences, which led to the company adding a flared handle to this model. That flared handle, which more players like, lets you easily wrap your fingers around the handle during games. That increases the comfort of your grip and lets you play longer without your hands cramping up. DHS makes our list a second time with the X6003 Table Tennis Racket. This paddle comes with rubber coverings on both sides of the blade. The red rubber on one side is great for shorter spots and ensuring that your balls stay in bounds, but the larger dimples found on the side with the black covering are more suitable for longer shots, which will make your opponents run after or chase down your shots. With the X6003, you’ll also enjoy a thin and lightweight blade made from five separate layers of wood. The bonding agents used between those layers will last for years, even if you play competitively in tournaments. DHS even provides you with a carrying case that lets you store the paddle between matches to keep the rubber soft and supple. One of the top features of the X6003 is the rounded shape of its blade. That shape creates a sweet spot that sits closer to the top center of the blade. This helps you keep the game going for longer and allows you to better return shorter and longer shots that come across the table. After examining dozens of ping pong paddles from multiple manufacturers, we ranked the JP Winlook Ping Pong Paddle as our top choice. Not only can this paddle help you improve the spin that you put on a ball, but it can also help you put more strength and speed behind your swing. It might just be the only paddle that you will ever need. JP Winlook created a smart and unique design that includes five pure layers of wood that make this a well built paddle. Add to that its smooth flared handle that fits hands of all different types and sizes, and you have a paddle that is suitable for players of all ages and skill levels.